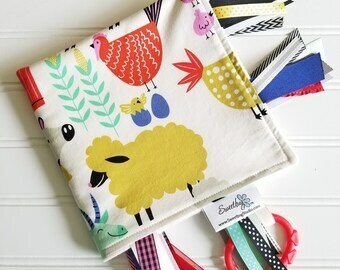 Sweetbug Studio’s Sensory Ribbon Blankets are a magnificent choice for baby's first security blanket. 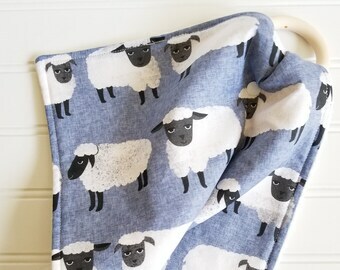 Using the softest organic cotton fleece, stunning prints, and ribbon carefully chosen to coordinate with each print, these blankets will provide comfort and cuddles for years to come! I have loaded on the ribbons to delight your baby’s senses. 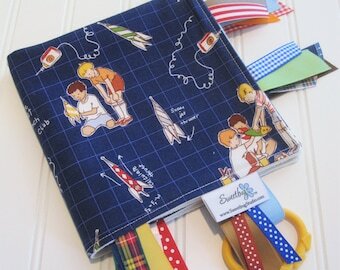 Each blanket features over THIRTY coordinating ribbons!! There is one ribbon loop. **Please note that although some photos may show an attached plastic link I no longer include these links with the product. 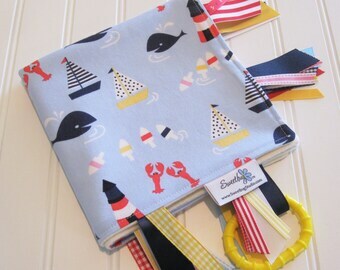 ** You can use the ribbon loop to attach a pacifier or use it to connect the blanket to a car seat or stroller with a link of your own. 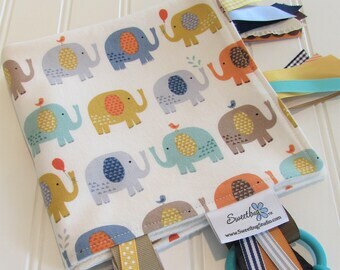 Each blanket measures approximately 14” x 14” with another 2” of ribbon. All blankets are topstitched for style and durability. Ribbon ends have been heat sealed (no chemicals). Sensory Ribbon Blankets feature quality printed cottons on the front and domestically made, GOTS certified, organic cotton fleece on the back. Sarah Jane has done it again! 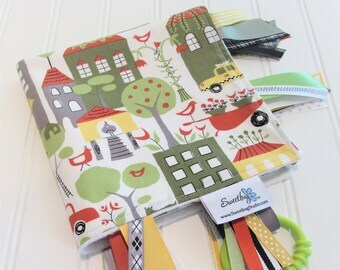 Her latest line of fabric, Sommer, captures her love of Scandinavian summers. 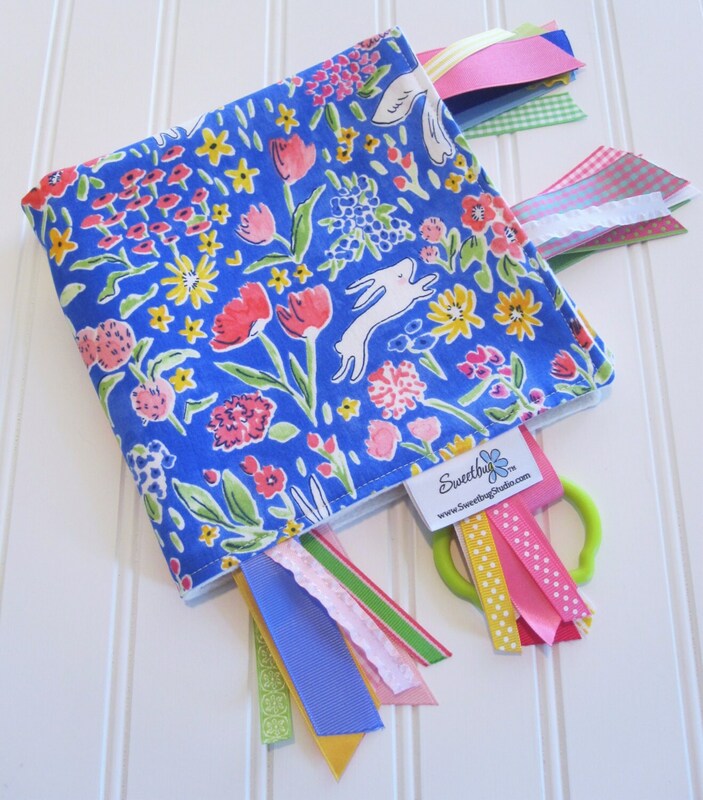 This fabric, Garden in Blueberry, features birds and bunnies in a field of flowers. The colors are stunning together--blues, pinks, green, yellow, and white. 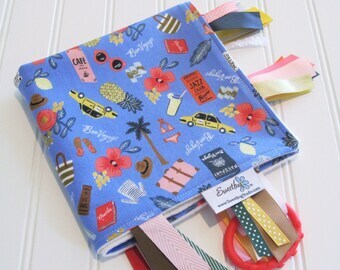 The print could not be any more precious and perfect for a sweet little girl! The back of the blanket is a super soft and eco-friendly organic cotton fleece in natural. All fabrics have been washed in a detergent free of dyes and perfumes prior to blanket construction. This eliminates any shrinkage surprises for you! Care: Machine wash warm/cold, delicate. Garment bag recommended because of ribbons. Tumble dry low/medium. For best results lay flat to dry. Warm iron on front fabric only. Do not iron ribbons or blanket backing. Do not bleach. 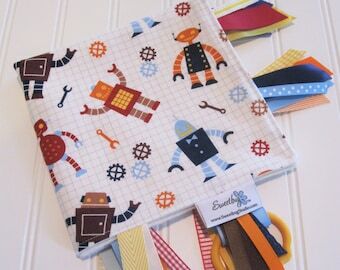 Sensory Ribbon Blankets may vary in pattern placement and ribbon print/placement but will always be made with the same detail and care in construction and design.